Get matched with requests for when you're available to work. Your calendar is where you tell us when you are available to work. By keeping your calendar up to date, you'll only be matched with jobs on dates/times you're free to take on new clients. The calendar is currently accessible on the web and our Android application for professionals. We'll be introduce it to our iOS application in the coming weeks. What happens when you block out time? 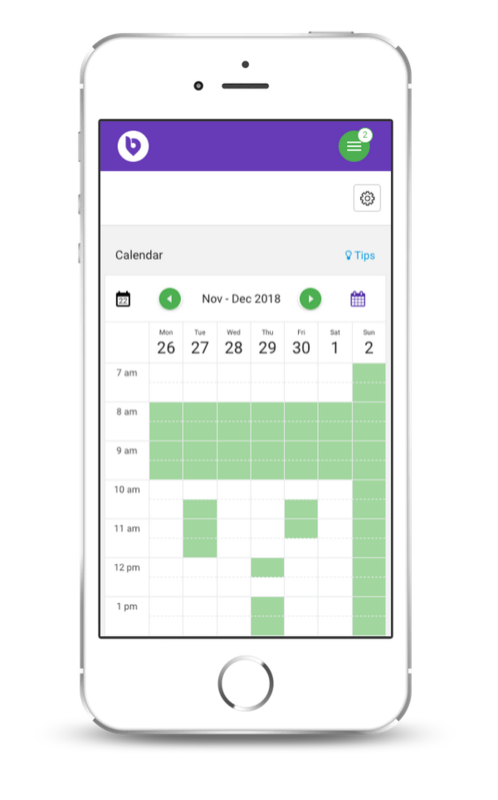 Our matching system checks your calendar and matches you to requests where you have availability. So if a customer is looking for your services on a specific day, and you have an hour or two free, you'll be matched to that request. Click the ‘Today’ button takes you to the current week. Click either green arrow to go forward or backward one week. Select the top right calendar icon and use the corresponding arrows to navigate between months. If you block a whole day and we receive a request on that day, you will not be matched to that request. You can block a whole day by either clicking on all of the free (white) blocks in that day or click on the date at the top to block the whole day out. If you block a number of half hour blocks and we receive a request that starts when you’re not free (blocked), you will not be matched to that request.You can block a half hour block by clicking any free (white) blocks. If you want to add a block on the same time all week, just for the week you are viewing, then click on the time in the left. To Unblock, just click on a block, a day or a time of the week that’s currently blocked. Click on the cog/gear icon (top right) to edit your business hours or click here.